Anyone who knows me knows I am a gadget lover and heading to the point of a junkie too. I love how our gadgets can make life so much easier and interesting, but I also like to sensible with spending money for these gadgets. I buy refurbished and save up my survey credits to use for future purchases. I fell in love with the future of computers when I was in college in the late 70’s working on my Computer Science degree. I was so intrigued at what I was reading about future devices, smaller computers and debit cards. Yes debit cards. The idea of not having to write a check again made my heart skip a beat. I’m a geek and I love technology. But one thing I really didn’t want or really have a need for was a cell phone. I love everything about cell phones, except the huge bills which come with it and I basically refused to pay for that. We do have a “pay as you go” basic phone that we have had for years that we only spend $100 a year for service and basically keep it in the car while traveling for safety purposes. Less than $10.00 a month for cell phone service was fine for us and worked great for so many years. My ipod was starting to fail on me and that gadget was what I used to text with for years as long as I was using wifi. I loved that ipod. I was starting to lose out on sponsored posts because I couldn’t post on Instagram without a cell phone. So, with any other expensive purchase in my life, I started doing lots of research. I talked to my family and friends about their experiences with cell phones and I checked out the cost of different non-contract phone plans and refurbished smartphones. Since there would only be one phone on the plan we decided to go with Ting Wireless cell phone service. Why? Because this service is another version of “pay as you go”, but what I like about Ting is that you only pay for the service you use. Talking, text and data are all separate, which I really love. The basic plan costs $6.00 per phone every month and then you also pay for what ever service you use. The picture above shows you the different size rates packages. Lets say you only use 400 calling minutes and 10 messages in one month, so you are only charged an extra $12.00 for a total of $18.00 for that month plus taxes. One of the things I found out is if you have an iphone and anyone you imessage who has an iphone and is around wifi, your texts don’t go against your bill! Main reason I decided to go with an iphone since all my family and friends use iphones. There have been months that I don’t pay any texting costs because I only used wifi service. Also, I have my data turned off on the phone so I don’t accidentally use that when I’m away from wifi. My bills haven’t topped $15.00 with taxes since I became a Ting service user. I love how I can customize my own plan and not a flat rate of options I might not ever use. I also figured that if in the future if I had to use a lot of minutes or messages, I’m still paying much less the majority of the time and saving more in the long run. Ting offers many types of phones for Android or Apple either new or refurbished. I choose the later because Ting guarantees their phones will work when delivered or they will replace it. You can go to Amazon or Ebay to get your phone, but you are at their mercy. Since Ting operates under Sprint network, make sure your device is programmed for Sprint. Thank you to one of my readers Cindy for pointing out that its a really good idea to make sure Sprint has coverage in your area. I did call Ting customer service to ask about my area and he did tell me it wasn’t full coverage. But so far, even with only 1 bar, I have been able to make calls with no problem. I choose a 4s because I wanted to make sure I could update to the newest OS system for a couple of apps I was going to need. 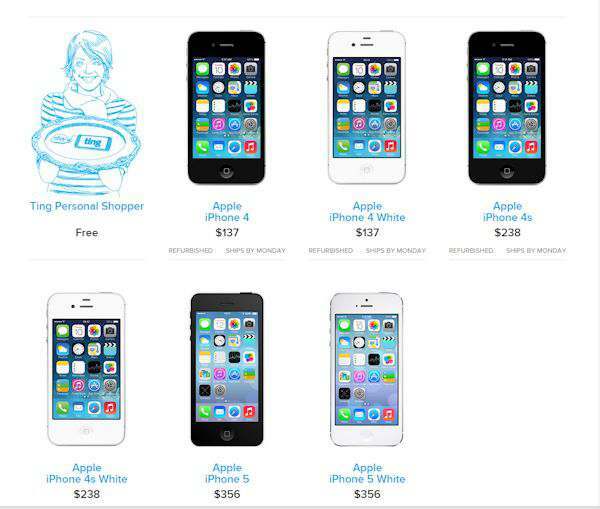 As you can see from the current picture above the refurbished ipone prices are a really good deal. I was saving up for a new ipod anyway with all my survey credits and the iphone was running about the same price. If you already have a Sprint phone, you can use it too. Even though buying a phone outright is an expense up front, you have to look at the money you will be saving by using the Ting service. Plus, when you decide to upgrade to a newer phone, you can always trade your phone into Amazon Trade program. Apple devices have great trade in value and I received $77.00 for my old ipod I sent to the trade in program and now have that credit with Amazon. If you prefer a non-smartphone, Ting has many of those options also. After you receive your phone in the mail, set up and activation is really easy on their website and if you need to speak to customer service, they are just a phone call away. I have spoke to them a couple of times to ask questions and was very pleased with how they handled my problem. Ting also has a great app to keep on your phone that will tell you how much service you have used during your month, your billing for each month and other items. I love this app. I look at it every few days to see how I am doing with my minutes and texts. You can download this app from your phone. I am really pleased with my decision of choosing Ting cell service. I know I won’t be able to use this service all the time or have unlimited usage to keep my bill down, but I know this is the right plan for my family. I will only use it sparingly outside of wifi usage, under normal circumstances. I love that I have limits to my cell phone usage and for those families who have decided that they have had enough with high cell phone bills, this may be your answer. I can use wifi for data usage all I want and not have to worry about it effecting my bill at all. But if I need it, its there. Now I want to save you $25.00! If you sign up with Ting Wireless you will receive $25.00 toward your future bill. Just click on any of the Ting links provided in this post or the ads in the sidebar or at the bottom of any of my posts and it will take you to their website. 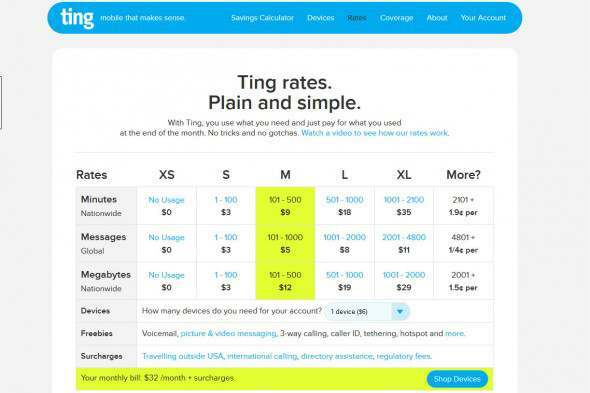 Also, after you have signed up with Ting, tell your friends and family about Ting and you can further lower your bill. If for any reason your credit doesn’t show up, please call them and they will take care of that for you. This promotion may be used at any time. 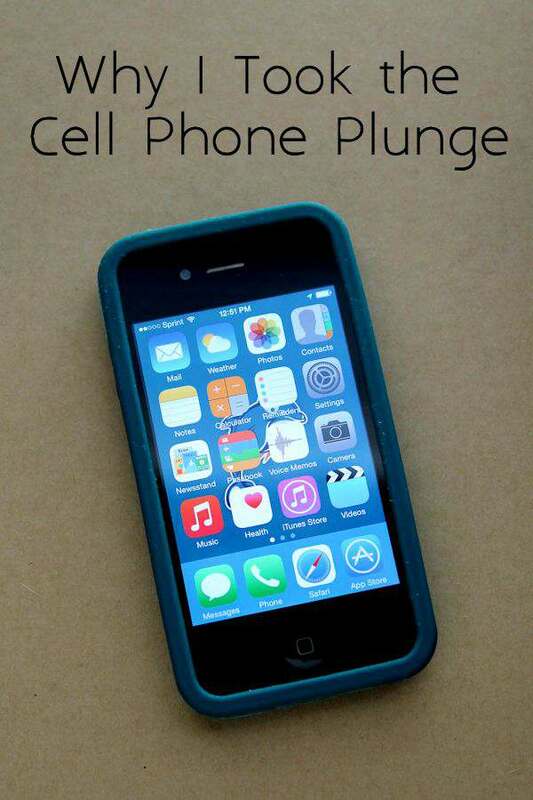 Do you think this type of cell phone service would work for you and or your family? I have not received any compensation for this review. The views and opinions expressed on this post are purely and entirely 100% my own. I just love this product! One thing people might want to check before moving to Ting is the Sprint reception in their area. Sprint around here has pretty spotty data coverage, so Ting is not an option. Otherwise I’d have moved a couple of years ago and I’m a heavy data user. Thanks for stopping by Cindy. Thanks for pointing that out about Sprint. That was one of the calls I had with customer service about coverage. Where I live I only have one bar but you walk outside and there is 3. It seems to be different all around my area, but I’m still able to make calls. that sounds like a GREAT deal!! I currently pay over $100 a month for cell service and that’s just ridiculous!!! I will definitly look into Ting Wireless!! That is the main reason I wouldn’t go with a plan like you are on. Please check into Ting to see if that will work for you in the future and thanks for stopping by. I have never heard of Ting but this plan looks great. Sadly today I can’t seem to think about not having a cell phone but I admit my childhood was much better without any of this. Thanks Nicole for stopping by. I have to giggle at your statement of not having a better childhood without a cell phone, since I have lived most of my adult life without one. It breaks my heart seeing how children are so attached to their cell phones now. Wow, I’ve never heard of Ting but I’m kind of kicking myself for not researching providers better before signing yet another contract with my current provider… Next time I’m set to renew I’ll have to check on Ting again! Thanks Lauren for stopping by. Please look into Ting why you are ready to renew. I have never heard of Ting. I know my husband is DYING to change up our plan. Thanks for giving me something new to look into! Thanks Kristin for stopping by. I hope Ting will work for your family if you choose them. I never heard of this company. Unfortunately I’m in a contract. WOW! I’ve never heard of this service and this is great info as we’re considering an emergency phone to keep at home! This would be perfect for an emergency phone. Thanks for stopping by Michelle. Well congrats on getting a cell phone 🙂 I can’t leave the house without it – what if something happens and you need to call for help? I haven’t heard of this particular provider, but wow there are so many phone services out there now. Great idea! My husband and no had talked about getting ting before. We’ll have to discuss again when our current contract is up. Its really worth a look into Paris. Thanks for stopping by. I have to say after I played with my new iphone and was texting my friend back home, she said isn’t it great to have a device that really works well. I had to agree with her. Thanks for stopping by. TBH cell phone explanations and what is offered confuses me! I know that our family can only do bundle packs where everything is included. We are phone junkies. This looks like a wonderful plan! Congrats on jumping in Tammy! And I know you will do this because the (little) I know you from reading your blog, but just as a young person, I ask you look up and not down all the time! This is one of my biggest complaints about the current University student, they don’t look up from their phones often and miss out on life going on around them! Hi Melanie and I so agree with you. The 2nd main reason I got this plan was to keep me from constantly looking at the device and using it. I’m glad to see a younger person, as yourself, seeing what is going on in the world today. Now if I can get my 8 grandkids to put the devices down. They don’t come to visit anymore because we want them to visit and not worry about what is on their devices. Sad Thanks for stopping by Melanie. Whoa! I cannot imagine not needing a cell phone. My cell phone is my everything, lol. I have never heard of Ting and it would not work for me or my family. We need unlimited everything. This would be great for my mom, though and I will look into it for her. Thanks for sharing. Ting sounds great. But Sprint service does not work well in my area. I am paying ridiculously for cell phones and wish I could change that. Thanks so much for sharing this at The Southern Special. Ting will sometimes help you know if you can get out of a contract too! And what a person actually uses may still be cheaper than an unlimited plan. It’s worth looking into for everyone if they can use Sprint reception. They can still have a family plan–it’s just $6 more a line, and they all share minutes/data, etc. I love it! I wondered if usage with Ting would still be cheaper with more than one phone with some of the other plans that people are in. I just hear most say they pay over $100+ a month for their cell phone. Great research process ot find what works for you and your family. We don´t have any trade in programmes here. *sigh* Enjoy your new phone and all its possibilities. Thanks for sharing via MMBH, I’ll have to check Ting out. Thanks for linking up at the Bloggers Brags Pinterest Party.